We went for a bicycle ride yesterday with Janie and John from Flamingo on a Stick. Tucson has a really good system of cycling trails, so we looked at the map and decided on a route that would take us around Davis-Montham Airforce Base, and the largest boneyard of airplanes in the world. They have a pickup truck, so we loaded up the bicycles, and off we went! We didn't really have a plan...we just figured we'd follow a route, and see how it went. There aren't a lot of hills in Tucson, so its pretty easy riding on nice paved or concrete paths. Some sections were even brand new! We knew we were riding near the air force base, but we didn't really know that we were going to be seeing parts of the largest aircraft boneyard n the world. It turns out that these planes are either in long term storage, being dismantled for spare parts, or in various stages of being sold for scrap. 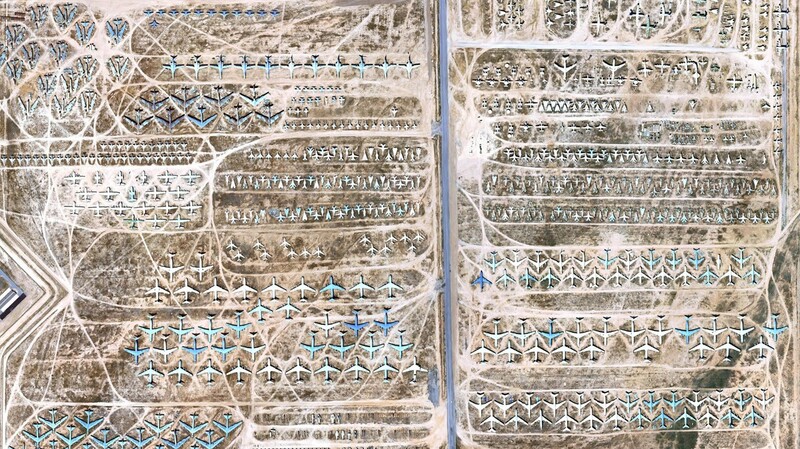 There are supposedly 4,400 aircraft parked here! When aircraft arrive at the boneyard, they are processed. Each aircraft brings along its entire history of documentation, including maintenance actions over its years of service. All guns, ejection seat charges, and classified hardware are removed, along with clocks and data plates. Each aircraft is washed on arrival . The washing is especially important for aircraft that have served aboard aircraft carriers or in tropical locations where they were subject to the corrosive effects of warm, salty air. The fuel system is protected by draining it, refilling it with lightweight oil, and then draining it again, leaving a protective oil film. The aircraft is sealed from dust, sunlight, and high temperatures. This is done using a variety of materials, ranging from "spraylat" (a white, opaque, high-tech vinyl plastic compound sprayed on the aircraft) to simple garbage bags. With the white coating, interior temperatures will usually remain within 15 degrees of the outside ambient air temperature. The plane is towed by a tug to its designated "storage" position. Not our taxpayer dollars, but I'm sure Canada's military has a aircraft boneyard too. Can't imagine the amount of money sitting on the ground here. 4,400 airplanes! These are not all "old" airplanes either. I came across one story about the C-27, a plane that only began production in 2007. There are already 12 of them here in the boneyard, with another five being sent here directly from the assembly line. The American Air Force has spent $567 million on 21 of these planes since 2007. A partial aerial view I found online. We had just come around to about our half way point in our bike ride, when Ruth said "uh, oh...I have a flat"! Sure enough, her rear tire had several thorns in it. We must have run over something, because I had a couple as well, and so did John. Not enough to cause problems for us, but Ruth's was flat as a pancake. We decided that Ruth and Janie would stay at the gas station where the flat happened and John and I would carry on and bring the truck back to pick them up. On the way back, we were on a brand new section of bike path. Man, we were still pretty far away. We didn't keep track of how many miles we were doing, but it took us an hour to get back to the truck! I figured the mileage out later and we had done 18 miles (29 kms)! Anyhow, we sure got lots of fresh air and exercise, and lots of sunshine as well. On the way back, Janie and John insisted on taking us out for a meal at Tiny's Restaurant, a local hole in the wall place that they said makes the best ribs ever. The ribs plate sells for $14.95, but there is easily enough food for two people. So we each split a plate of ribs and had a couple of beers. What a great meal, they were right... it was delicious! We had such a good day...thanks guys! That boneyard is just a prime example of military misspending. What a gigantic waste of money - and I am sure you are right, Canada has one of them too. It would seems that way, that is for sure but after reading some of the other comments below, I guess it isn't a total waste money. It does sound like they make use of as many parts as they can and recycle as much as they can and of course some are there for future service which I certainly hope will never be needed. We really enjoyed our tour of the boneyard. It was on Paul's list of "must see." We were not disappointed. If you can at all swing it, don't miss the Titan Missile Museum. What a ton of history and amazing stories. Maybe will we try to do the bone yard tour on another visit. We already saw the Titan Missile Museum the other day, I guess you missed that post. It was a very interesting tour and we were glad that we did it. We have driven by thee many times and camped just down the Road at Picacho Peak resort a few times with some friends over the years. A nice area that we enjoy. Katrchener Caverns is a nice tour as well as a walk around Tombstone if you get a chance. We did both Kartchner Caverns and Tombstone when we came to Arizona back in 2006. We wouldn't have minded seeing the caves again but not on this trip. And we have no desire to go back to Tombstone, glad we went once but no need to go again! Wow, those bike routes are reminiscent of The Netherlands. Sure makes getting around easy. Too bad about the flat tire though. I loved all the Tucson bike paths and routes when I lived there in the 90s. Sounds like they've added a few since then! Don't miss the goathead thorns though. I am pretty sure that they have added quite a few more. They are working on a loop trail, that when it is completed will be 130 miles of paths and shared bike lanes. The Bone Yard actually makes money for the US govt. They usually sell reconditioned aircraft parts to foreign govts. who still fly older American aircraft sold to them. I was shocked to see the stock pile of B2 bombers then was told they were part of the decommissioning of arms agreement with the Soviet Union now Russia. Thanks for that additional piece of information. We knew that some of the planes we sold to other countries but didn't realize that some of the parts were as well. Ah, you've had your first run-in with goatheads! As we traveled and cycled around the southwest US, we became intimately familiar with these devilish little "sand spurs on steroids". You almost have to use tire liners or "Slime" when riding in this area of the US, and even those precautions won't prevent all flats. But it's a great place to ride other than that. We loved the bike paths there! My tires had the "slime" in them but that didn't help, there were just too many of them. When we had our dog with us, she didn't like those goatheads either, they would get stuck in her paws and then she couldn't walk, the poor thing. I enjoy seeing what my tax dollars have been spent on. True , some of the planes have reached the end of their service lives and are broken down for parts and scrap (just like cars), but many more are in storage for potential future use, too. When our government decides to downsize forces, some aircraft are put in storage, then at times when there is a plus up of forces, the stored aircraft are returned to service. So, they are not all junk. Too bad you didn't take the bus ride that goes right through the boneyard, it was a very interesting tour. You can catch it at the nearby Pima Air Museum. Maybe we will do the tour some other time when we are in that area again. Hopefully we will never have to see the day when they have to bring many of those planes out of mothballs because if they do then it would look like some big war is on the way! We would like to have made it to the Pima Air Museum but it seemed like we had enough on the go as it was, so maybe that will be something for us to do the next time we are in the Tucson area. Interesting, the A10 AKA Worthog is loaded for Bear. Sidewinders and AGM missiles under the wings. It's amazing that you can from see this from the pictures! Shows that we have very little knowledge about these planes or many others in fact. We sure did love watching come in to land though! Is the boneyard in Markham Ontario still around, are there others in the area? I believe that we had heard about one in Markham but have never been there so we have no idea. As for others in the area, if you are referring to Tuscon than yes, there are others in the area but I don't think they are as big as this one. Almost caught in a storm! What's around the next corner? Why do they make it so confusing?! Busy day with new friends! Sherman has a new awning! A four wheel drive adventure! Finally, our propane adapter installed!